With more than twelve years of experience as a music educator, Myranda has taught musicians at all ages and levels of experience—from beginners with no prior experience to intermediate and advanced students. As an avid percussion performer and ethnomusicologist, Myranda brings a unique combination of insights about percussion techniques, cultural contexts, and music styles to her teaching. 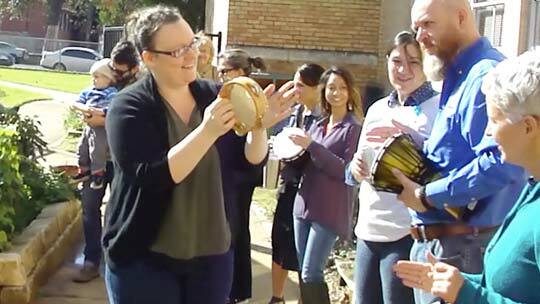 She regularly leads educational music workshops, percussion clinics, and guest lectures in the Central Texas area. Myranda believes that we are all born with innate musical and rhythmic sensibilities and that everyone can experience the greater benefits that music has to offer through rhythm and drumming. Audiences love the engaging and interactive nature of her lessons, workshops, lectures, and clinics and her flexible teaching style that adapts to the needs of diverse age groups, abilities, and levels of experience. If you’d like to schedule Myranda to speak at your school, nonprofit organization, conference, or event, please contact her through this form.